Cardiac ultrasounds, or electrocardiograms, utilize sonography to create detailed images of the heart and capture the complex patterns in which its valves and chambers move. M-mode ultrasound, also referred to as mobile mode or time-motion ultrasound echoes a stationary transducer beam from the reflector of a movable probe. High frequency sampling--as many as 1000 pulses each second—provides an accurate assessment of the motion of heart structures. In a phenomenon known as the Doppler shift, as tissue moves away from a cardiac probe the wavelengths of energy reflected from the probe lengthen vis a vis those of the transducer beam. Conversely, when tissue moves toward the probe, reflected wavelengths become shorter. By comparing changes in the frequency of the echoed beam with transmitted beam frequencies, cardiac ultrasound devices create a true-to-life representation of the movement of the heart over time. In order to achieve angulations that allow all of the heart’s dimensions to be measured, the transducer beam must be transmitted from a variety of positions. As such, hand-held cardiac probes are used to gather readings from many points across a patient’s chest. Electrocardiography solutions generally integrate physiological assessment techniques such as ECG, heart sounds and pulse tracings, generating simultaneous recordings that allow imaged movements to be precisely associated with functional measures. Acoustic readings for cardiac ultrasounds must be taken in the small space between the ribs. Readings may also be obscured by lung tissue. As such, phased or microconvex arrays, which are smaller than curvilinear arrays, are generally used for cardiac probes. Larger probes are occasionally used as well, but may generate rib shadows that interfere with image quality, although shadows may be minimized by aligning the beam with the ribs. An indicator on every cardiac probe marks the beam’s leading edge and corresponds to an indicator on the monitor, enabling sonographers to correctly position probes to obtain necessary views. Probes are available in a variety of sizes that are appropriate for adults, children and neonates. 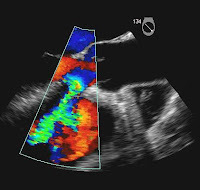 Leading producers of cardiac ultrasound probes include GE Medical, Philips and Siemens.